Auburn Apartment Guide - www.AuburnApartmentGuide.com does not guarantee the accuracy of any information available on this site, and is not responsible for any errors, omissions, or misrepresentations. Product information including availability, features, floor plans and rent ranges are subject to change without prior notice and should be verified independently with the property managers. 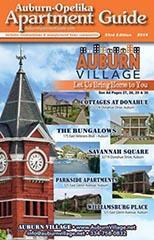 This Web site is the product of www.AuburnApartmentGuide.com. Visiting: You are not required to provide personally identifiable information to visit the www.AuburnApartmentGuide.com site. We do collect usage data, ZIP codes and other information on all users, but it is not personally identifiable except as described below under the section IP addresses. Site Interaction: The information you provide when fill out other forms on our site may be stored on our servers or, in some cases, in a cookie on your computer. This information will be used to compile aggregate data that is not personally identifiable and may be used internally or shared with third parties. This information may also be used to confirm and fulfill a request you are making, to follow up on that request and to communicate with you about the www.AuburnApartmentGuide.com service. The messages that Auburn Apartment Guide sends for these purposes may incidentally include promotional material or other content from www.AuburnApartmentGuide.com or its partners. In the case of these messages, we are not sharing your personally identifiable information with third parties, nor will we continue to send you promotional messages if you ask us not to, as described below in the Section entitled "Accessing, changing or deactivating information collected by www.AuburnApartmentGuide.com." Visitor Behavior: www.AuburnApartmentGuide.com may perform statistical analyses of user behavior in order to measure interest in the various areas of our site, for development purposes, and to inform advertisers and partners about consumers who click on their advertising or other messages. In these analyses, we will disclose information to third parties only in aggregate form, except as specified below. We also may use personally identifiable information to improve your experience while you are visiting our site. This might include prefilling your personal information into Web forms so that you do not have to retype it or presenting you with editorial and advertising content that may be of interest. As is necessary for third parties to provide information or perform services specifically requested by you. If through www.AuburnApartmentGuide.com you request additional information from an apartment community or property manager, we will share your information with those companies. Personally identifiable information may also be included in reports to these third parties, but only when you have already submitted the information to the third party as described above. After information is provided to such third parties, www.AuburnApartmentGuide.com does not and cannot control their subsequent use or disclosure of information. For direct marketing purposes, but only if you have authorized www.AuburnApartmentGuide.com to do so and only if you are 18 years of age or older. Although www.AuburnApartmentGuide.com will notify all third party direct marketers that the information provided to them is confidential, www.AuburnApartmentGuide.com does not and cannot control the use or disclosure of information by such marketers after the information is provided to them. To perform analytical and other services as an agent of www.AuburnApartmentGuide.com. In some cases we may work with third parties that do analysis and development on our behalf. We may share your personally identifiable information with such a third party on the condition that the third party maintains the information as confidential and only uses the information to perform the services specified by www.AuburnApartmentGuide.com. Auburn Apartment Guide sometimes offers you the ability to send e-mail to a friend or other third party. E-mail a Friend functionality is for informational purposes only and may not be used for any unlawful purpose. This includes all harassment or threats. Accessing, changing or deactivating information collected by www.AuburnApartmentGuide.com: If you wish to access, verify the accuracy of, change or deactivate your personal information on file with www.AuburnApartmentGuide.com; change your permissions regarding use of personally identifiable information for direct promotion purposes by www.AuburnApartmentGuide.com or its partners (including affiliates and third parties identified in this policy). Deactivation of user information: If you deactivate your user information, your account information will no longer be used by www.AuburnApartmentGuide.com or made available to any third parties except in an aggregate form or as required by law. www.AuburnApartmentGuide.com may use a third-party advertising company to serve ads when you visit our site. This company may use information (not including your name, address, e-mail address or telephone number) about your visits to our and other Web sites in order to provide advertisements about goods and services of interest to you. In addition, we may share Web site usage information about visitors to our sites with this company for the purpose of managing and targeting advertisements on our site and other sites. For this purpose, we and our third-party advertising company note some of the pages you visit on our site through the use of pixel tags (also called clear gifs or single-pixel gifs). In the course of serving advertisements to this site, our third-party advertising company may place or recognize a unique "cookie" on your computer.